I agree with dimitriye98 - we've never had any confirmation that Rose actually reciprocated on Pearl's feelings for her. There's no doubt that Pearl was in love with Rose, but I don't think that Rose shared it back. the episode Arcade Mania wrote: Steven: *Eating cereal* So, what's today's mission? I hope it's... fighting, a giant... foot! Pearl: If we're suppose to fight a "giant foot", *twirls spear* Garnet would let us know. Amethyst: Yeah, Garnet's the boss. Pearl: Well, we're all a team. Garnet just has heightened perception that guides us towards our mission objective. If one of your team has psychic abilities, it makes sense to let her plan most stuff. Garnet gets her way through democracy, not dictatorship. Well, Garnet determines the missions, because she's the one who knows about them. I still think they share responsibility. For example, in the issue raised in the last few episodes, Garnet took a back seat and let Pearl handle things and decide how to tackle the problem. Yeah the fusion is more than the sum of it's parts, she should get three. Zohar - How'd your Steven Universe costume idea pan out? In that Arcade Mania bit I mentioned, Amethyst sounds pretty happy when she says "Garnet's the boss". In "The Test", she says Steven shouldn't be taking advice from her. In "The Return", when they're trying to convince Steven to join the evacuation, Amethyst says she's not good with that stuff. At the end of the Sardonyx arc, Pearl's got a short speech about needing someone to tell her what to do, and that she feels useless on her own. Maybe Garnet has the leadership role because she's the only one willing to take it on. Isaac Hill wrote: Zohar - How'd your Steven Universe costume idea pan out? It didn't - I tested bleach on the tiger onesie we had in our house (for last year's costume) in the hope of coloring it pink later but it did absolutely nothing. So, with no lion, putting on a Steven shirt and jeans didn't seem like much of a costume (let alone a recognizable one). Stevenbomb 4. The first two episodes have been good, but don't seem to fit in with what previous episodes have shown. I was kind of underwhelmed by this one the first time I saw it. I think I'm just not that interested in Ruby and Sapphire. Plus, it's odd that they were able to fuse when they didn't seem to know each other that well. Garnet's an expression of their love, and has said that love at first sight doesn't exist. But love at first tackle does? I watched it again when it aired after Steven's Birthday and paid more attention to the gem history in the flashback. I think one of the silhouettes was the same Lapis Lazuli from the mirror: she had similar build and gem on her back. Sapphire & Lapis both have (had?) blue diamonds on their outfits. Peridot and Jasper both have yellow diamonds. It looks like that indicates who they work for. I've read some guesses that some datails had religious significance. One was that Garnet's statement that this happened over 5,750 years ago meant that it happened at around year 0 of the Jewish calendar. Another was that Blue Diamond's appearance was based on the Blue Madonna. Do either of these sound actually significant, or just coincidence? Amethyst as the car seat was one of my favorite SU jokes in along time. When I first saw the car seat, I kind of wondered where they got it. I figured it was in the barn with the other junk, and didn't think any more of it until it started talking. It was both unexpected and perfectly logical. My only issue is that everyone was wondering how Steven would age, when they already learned that his physical age is dependent on his mental state during So Many Birthdays. Everything from that episode was forgotten except for the outfit. I agree with most of what you wrote, but not all. First, I thoroughly enjoyed The Answer on first viewing (and second). I thought Steven's Birthday was slightly weaker, but still good, particularly for the side characters and their interactions. It's true the character I care more about right now is Garnet, not Ruby or Sapphire. But since the show is from Steven's POV, and he definitely wants to know more about them, it makes sense we'll hear such a story. 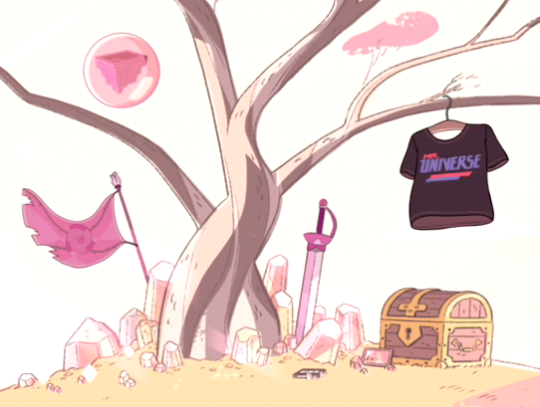 Plus, like you said, it gave us a ton of info on the history of the (Steven) Universe. I saw someone mention that Pearl's spaceship outfit (from Space Race) has a pink diamond, and it seems that's true. She also has a more pinkish hue than Blue Diamond's Pearl. Doesn't mean she's necessarily Pink Diamond's Pearl, but I'm really curious whose she is, and whether Rose is Pink Diamond. As for the love tackle - I think it might have more to do with Ruby's devotion at that moment, to save Sapphire, and Sapphire's confusion. It wasn't love at first sight, it was something that showed them their potential. Of course you don't need to have love to fuse (look at Malachite...), but I think Garnet explained that's when it's the most stable. Re: 5750 years, that definitely sounded like year 0 to me. I don't know if it's significant. Maybe the show's Earth doesn't have Judeo-Christian religions because of gem involvement? Yeah, the car seat joke was wonderful, I loved it. I don't mind the changed from So Many Birthdays - it's still unclear how Steven ages "naturally" - no one ever existed like Steven, and he hasn't done any aging changes since then. Also I think Greg wasn't in Too Many Birthdays, so maybe the gems kept it for themselves? I was recently struck with what a sacrifice Greg has had to make, by having Rose go away for Steven to exist. We don't know how much the two of them discussed what's going to happen, I would guess they did, and quite a bit, and I wouldn't be surprised if Greg was the first to talk about children (Rose being all "What is this 'children' thing you speak of?"). But still, even with all the preparations, knowing he can only ever have one of them around, not knowing when or if he'll see Rose again, having to deal with the conflicted (or straight up hostile) emotions from the other gems, and still being so supportive and good for Steven, he's a pretty amazing dad. up to "It Could Have Been Great"
I first thought this was setting up a Peridot betrayal, but then realized that you can't betray someone you never actually joined. Peri's coming around on the CGs personally, but not ideologically. She's probably gone from wanting to detroy them when she dooms Earth to inviting them to join her on Homeworld when she dooms Earth. I was kind of surprised she never suggested just staying on the moon. The ambiguity about Pink Diamond is getting a bit rough, though. The 4 color logo was on the moon base, and there were paintings of the Diamonds on the walls. So shouldn't Steven have noticed if there was a giant painting of his mom? I can see no one telling Greg about "Too Many Birthdays". Greg didn't even know about Steven and Connie fusing in "Alone Together" until "We Need to Talk". Rose kept secrets from people she was closest to; maybe Steven takes after her that way. Malachite definitely isn't made of love. But, Jasper and Lapis had to do a fusion dance to deliberately form her. Garnet first formed by accident during a tackle. I'd taken the ease with which R&S refused in "Jailbreak" to represent the strength of R&S's bond. They're so close to each other, and know each other so well, that they're in sync without dancing. Now, it turns out they can just do that. I still see R&S as Garnet's components, not as their own characters. So, it's hard for me to get invested in their stories. It's not just that their refusion is inevitable. It was clear that Steven wasn't going to stay a baby, but Connie and Greg are well developed enough that I'm interested in seeing how they deal with it. When R&S are on screen, I'm just waiting. Maybe if there was a story of just Ruby, or just Sapphire, I'd get a sense of them as individuals and care about them in their own right. Up to and including "It Could Have Been Great"
Yeah I was very much WHERE IS PINK DIAMOND?? Although what we saw of blue and yellow was very stylized, and possibly if Steven saw it he wouldn't be able to recognize her. I don't know, this episode made me think Rose may very well not be Pink Diamond - I would guess the other gems would refer to her. I didn't notice Pearl wistfully sighing at any point. Re: Peridot - I think they're writing her character really well, and I agree with your analysis. I imagine Steven will confront her at some point (tonight's episode?) about the crystal she took, but won't say anything to the crystal gems until he tries. I'm also still very curious about the Bismuth inside Lion.That's unrelated I suppose but I keep thinking about it. Is it a past lover who didn't join the rebellion? Is it a strong opponent? Re: Ruby and Sapphire - I agree that a lot of their purpose is to explain Garnet. It would definitely be interesting to a story of one of them on their own. We got a bit of that in the week of Sardonyx, where each had their own, very separate, ideals. As of "Message Received", I think they've shown all the footage from the "Steven's Birthday Week" ads. Tomorrow should be a total surprise. Good call on Steven confronting Peridot before going to the CGs. I was surprised that Peridot actually tried talking Yellow Diamond out of dooming the Earth. Peridot tought she could convinve Yellow Diamond that Earth and Homeworld could co-exist. That's very Steven of her. I caught a glimpse of what looked like the bottom of Pink Diamond's mural in "It Could've Been Great". It was more angular than Rose looks. But, a big pink lady with big pink hair, and a pink gem in her belly should've been enough to make the connection. I'd just assumed that Rose was Pink Diamond since that would explain why the Pink Diamond symbol only appears on pre-rebellion gem stuff, and why Rose is the same size as the 3 Diamonds in the mural from "Serious Steven". But, if Rose broke PD, that could also make sense. The surviving Diamonds seem more like the type to throw a fallen comrade down the memory hole than to honor her memory. Having a second possibility will definitely make watching the mystery unfold more interesting. Either way, I wouldn't expect the CGs to bring it up to Steven. They try to hide the worst of the details from Steven. Greg might not even know. I wonder how much Peridot knows about Pink Diamond; she has seen the painting of Rose in Steven's house. We've seen everything else in Lion's mane. They'll probably get to the bismuth eventually. I saw a rather interesting theory about Pearl not belonging to Rose or Pink Diamond. So far all the other Pearls we've seen have match the colour of their respective leader and have a similar gem placement to their leader. Pearl's gem doesn't match Rose's and she looks white rather than pink. Yeah, that wouldn't surprise me. I wonder about the differently-colored gems. Amethyst and Ruby don't have any of the diamonds' colors. Are they simply mass-produced and assigned to a specific diamond? A friend just sent me this article about Steven Universe and its portrayal of grief, and I found it surprising. I never considered Rose to be dead on the show, and show I suppose I didn't consider all the characters experiencing grief, specifically. But then, the feelings of loss and emptiness they portrayed resonated with me quite a bit - particularly in Lion 3: Straight to Video. As someone whose mother died from cancer (so she had plenty of advance notice and time to prepare), it was a very emotional episode, and the thought of it makes me tear up a bit just thinking about it and writing about it right now. I suppose no matter why she's absent, people can still grieve for her. I suppose that's true for lost relationships as well, though it's much easier to say "they're in a better place" about someone who moved up in the world, as opposed to someone who died (unless you believe in that sort of thing). Huh, I've always considered her to be dead. Especially the way that most of the characters tend to trail off when they say 'your mother' or 'Rose'. It never really occured to me that other people wouldn't think of her as dead. I guess I thought differently because of the sci-fi aspects of the show. She gave up her corporeal form for him to be born but it always sounded like there was something more literal and concrete that was left over or will be left. I always took Rose's status to be a metaphor for someone who died in childbirth. The magical/sci-fi aspects of the show allow for the possibility of her coming back, since her gem's not damaged. I figure Steven's body's acting like a bubble, or Lapis's mirror, preventing Rose from reemerging from her gem. If the gem were removed from Steven, that might allow Rose to reemerge, but Steven might not survive. If Steven ages like a full human, maybe Rose would reemerge after his death. I don't know if the creators have decided on that yet. I read that the creators had stated that Steven would not reform if he were poofed. But, I think I read that in a comment thread on a review site, not anything official. Now you're reading my remembrance of that post, so it's like 3rd degree hearsay. I also don't know if the characters have ever considered Rose's possible reemergence. Barring the other ends of phone conversations, we pretty much see only what Steven sees. Since I doubt the characters would be willing to have this conversation in front of Steven, it might not come up in show. I was surprised that they wrapped up two major arcs so quickly. It felt a bit anti-climactic, but that may be due to the long wait between episodes killing the momentum. How many months did we wait to find out what was next for Malachite and the Cluster, just to have them disposed of in one episode each? At least they were good episodes. The previews showed quite a bit of the Malachite/Alexandrite fight, but left the Watermelon warriors as a surprise. Maybe my favorite part of the episode was when Pearl tried to save Jasper from falling into the crevice, but not very hard. She just leaned over a bit, then decided not to bother. Gems can stretch, she just didn't want to. That seemed to be the Jasper side of Malachite talking about how she's grown to like fusion. Combined with Peridot's explanation of the gem shards desperation to be a whole gem, it looks like they're setting up Jasper to fuse with shards to become more powerful. Lapis' tour was a pretty clever way to show a bit more of the world while keeping everything from Steven's POV. I got a kick out of Steven giving the typical "become one with nature" line and Lapis wondering why she would want to do that. A while ago, I mentioned wanting to see an alternate Gem team of Steven's non-Crystal Gem friends: Peridot, Lapis, and the Centipeetle. There'll probably be an episode or two of Odd Couple type bickering, but we're two-thirds of the way there. I think there's still two episodes to go, one May 26th, one June 2. It was over so quickly, it really does feel like 'now what?'. I hoping we get wind of Yellow Diamond being on her way soon, but I suspect quite a few of the up coming episodes are going to be back to Steven just getting on with life. We haven't seen Connie in a while. Steven Universe has affected the way I view other media. Last night, I watched 1408 for the first time, a movie about an evil hotel room. While the protagonist was fighting the room and trying to escape, I wondered, "He's not even going to try to talk to it? He could at least apologize for insulting the decor when he first entered." It makes sense that we haven't seen much of Connie in a while. The Crystal Gems have been dealing with the Cluster, which is beyond Connie's abilities, and Steven hasn't had much down time to just hang out with anyone. Except for Steven's birthday, there haven't been much of any humans in a while, probably due to Steven being at (or under) the barn instead of in town. Now that the Cluster's been dealt with, and Lapis is warming up to Peridot, Steven might return to Beach City, which will allow for more civilians to show up. I'm guessing the ruby-eyed Ruby is going to set up some Homeworld Gem arc. That probably won't require Steven to stay at the barn beyond tomorrow's episode. I already liked Lapis, but she's quickly becoming my favourite. It was interesting that all the Rubies have rubies in different places on their bodies, and then the rubies stayed in the same place when they fused. Also, wondering if 5 is a special and/or max number? Can gems just keep stacking and stacking? We've got 6 gems now plus Steven (Garnet counts as two) - if 5 is a max could lead to some interesting dynamics at some stage I guess. A bit disappointed that they just the Rubies off though, seemed like a pretty cheap resolution. Why would the think Jasper was the gem leader nad not care about anyone else? That really made no sense. Angua - The Rubies' differing gem positions and their locations in the fusion didn't strike me as any different than what we've seen before in other fusions. Maybe the Cluster counts as more than 5 gems fusing. Five may not be a hard limit, but it does seem to get trickier to maintain the fusion when the components disagree, and that's going to happen more with larger numbers. Rubies might have an easier time of it, since they don't seem bright enough to come up with many differing opinions. The Rubies said they were looking for the leader of the Earth mission, which was comprised of Jasper, Peridot, and Lapis. Lapis was already on Homeworld's bad side, since she was in prison during Jailbreak, and Peridot had insulted Yellow Diamond. Jasper was the only gem on that mission still loyal to Homeworld; I'm guessing this was a rescue mission to retrieve her. The traitors aren't a concern since, as far as Homeworld knows, the Cluster is about to destroy the planet and any Gems on it soon, anyway. The imminent doom of the planet to be searched meant the rescue mission was pretty risky, which might explain why Homeworld didn't exactly send their A-team. And Lapis was pretty great in this one. New episodes every weeknight for the next 4 (I think) weeks. There were two Monday and one today (Tues). I assume the two Monday were the anomaly to fill out the half-hour, and 1 ep/day will be the case for the next couple fortnights. The shot of Steven lightly touching down with one foot was highly reminicent of Rose landing in an earlier episode flashback, which was a nice touch. Steven's line about his floating being controlled by his emotions "just like all my stupid powers" was great. And, each of the original CGs got a decent gag suited to them. Amethyst forgot Steven couldn't fly. Garnet broke into a car to steal a phone from the same guy who was pissed at her about the sign. Pearl wanted a hug. My only gripe is that I spent the whole episode thinking Amythyst should shapeshift into a bird and tow Steven down. I get a bit distracted from what's happening on screen when I'm thinking that the characters are missing something obvious. Even if they'd tried it and failed, I'd've been satisfied. This was the weakest of the 3 so far, mainly because Marty's too 1 dimensionally dickish to be that interesting. His name being Marty reminds me of Martin from Adventure Time, a much more interesting absentee father. Sour Cream and Yellowtail's relationship prior to this epsiode confuses me. SC mentioned arguing with his stepdad in "Joyride". But here, Yellowtail seemed like he was trying to be nice all along. I'd chalk that up to SC's bias, but Vidalia mentioned them being at each others' throats in "Onion Friend", making it sound more equal. I liked that they acknowledged Steven's super strength. We've seen him do impressive things before: toting that Cookie Cat mini fridge around, carrying the teens (escaping the moss, I think). Having him do increasingly impressive feats until someone notices is a good way to introduce a power without spending an entire episode on it. This is not meant to be the slam on "Steven Floats" that it looks like. I just appreciate the variety. My favorite so far. The big draws are the songs and Pearl/Greg arc, but I really appreciate the little touches, like Pearl acknowledging that Rose in fact would have loved the silly burger commercial. I didn't think Pearl and Greg were that uncomfortable around each other, though. They seemed to get along OK fixing Greg's van. The "Too Cool for School" graphic novel came out last month. Unlike the comics, it's (mostly) a single story, with one extra short at the end. Pearl seems to get the most development in the comics. In one of the previous comic shorts, we see the storage space inside Pearl's head. In TCFS she fights with tonfas instead of her spear. I don't thnk Garnet and Amythyst do much besides what we them do in the show. I'm so happy it's back. I thought Steven Floats was a wonderful way to get back to the show. Everything was was pretty much perfect for me. I heard people say the Crystal Gems didn't do enough to bring him down but... like... they put an entire boat on him, then jumped on top of it. There wasn't a whole lot else they could do. The Garnet "future vision" part at the end was wonderful too. I agree about Drop Beat Dad, I think it's the weakest one. It's OK, I suppose, but doesn't get to "good". Mr Greg was really fun. It was like watching a Steven Universe musical, which is already a very musical show in itself. One thing that really touched me is that Steven meant for Pearl and Greg to talk things out between them. It's unfair and sad and wonderful that Steven feels he has to take care of his family in this way. I didn't know there was a graphic novel out, perhaps I'll get it. I was somewhat excited while watching Monster Reunion. So much information about what happened during the Gem Wars! So much sad for Centi! So apparently there was some sort of leak about the episodes of the next two weeks, and one of the creators has been begging people to avoid publishing them and discussing them. The subreddit for SU came out in a statement that all leak-related posts for those two weeks will be immediately moved to the /r/SULeaks. I can only assume there will be some major events happening. I'm pretty hyped. Possibly. It could also mean ENDLESS HEARTBREAK. Speaking of, we need more Crying Breakfast Friends. Monster Reunion was definitely one of my favourites so far! I hope that they find a way to un-corrupt the gems. How did the crystal gems escape the corruption?? I was wondering about that too, and I have no idea... Maybe they were in a bubble? Yeah, given how powerful Steven is already, Rose seems pretty OP compared to the rest of the gems. Obviously she's bigger than them which seems to signify power (interesting that the diamonds are so massive). I thought it was an interesting revelation that the new gems on homeworld are being made smaller and with less powers as they are running out of resources. Obviously there seems to be an innate amount of lifeforce per planet if you look at what they said would have happened to Earth. I wonder if it's no coincidence that the kindergarden was a dessert canyon. I also wonder why they can't just use any random planet - surely there are plenty of minerals on Mars - is there a specific reason they need to be in a populated planet? I think they absorb 'life force' to grow which means that dead planets are probably not useful for them. I'm glad to know that there's something coming in the next couple weeks, but not know what it is. These past few episodes have been good, and I've laughed a lot, but there's been a lot more filler than SU usually has. I was psyched to see the Centipeetele again, and it's good that she got a happy ending. But, my hopes for a Peridot/Lapis/Centipeetle alternate team are crushed. In "The Return", while evacuating, Greg says something like, "In the end, your mother was only able to save a few of her closest friends. If it weren't for her shield..." I assume this means that Rose, Pearl, and Garnet were saved from corruption by hiding behing Rose's shield. Amythyst missed the war because she stayed in the ground too long, so she was probably uncorrupted because she hadn't come out yet. Or maybe the corruption is why she stayed in the ground too long, and is smaller than she should be. In Lapis's flashback ("Same Old World", I think), we see many Homeworld Gems fleeing, then a something odd, I forget exactly what. This may have just been a major warp opening, or could have been the corrupting weapon. Lapis may be upset about spending all that time in the mirror, but it appears to have saved her from being corrupted. Speaking of time: Zohar, we'd thought that the time Garnet mentioned in "The Answer" was significant for meaning the Gem war ended at year 0 of the Hebrew calendar. It turns out 5,730 years is the half-life of carbon, which may have been what they were going for. When we first saw the explanation for the injectors, it looked to me like they were sucking the life out of organic material. One of the chibi shorts had Amythyst talking about sucking up the "good stuff" to make Gems, before being interrupted by Pearl, like she's trying to protect Steven from a harsh reality. All in all, I'd say the Kindergardens need to drain organic life in order to function. The site of the Kindergarden is still barren millenia later, it appears to be pretty damaging. I wonder if Peridot could use her Certified Kindergardener skills to draw just a little life force, maybe from an invasive species like kudzu, to fix the corrupted Gems? Gems are basically Homunculi powered by Philosopher's Stones created through wide scale death. So, this fusion thing seems to be pretty addictive no matter who's doing it. While I'm loving having a new Steven Universe to watch every night, it's getting pretty hard to grasp the scope of the season. I think I'll rewatch season 3 after it finishes airing. Jasper fuses with a bunch of corrupted gems and becomes a giant, [more] insane monstrosity. Alternatively, she gets to the core and tries to fuse with the cluster. I find that unlikely. I don't know, it seems a bit too confrontational for the show. I imagine no matter what, I'll probably be surprised. Up to and including "Bismuth"
It sure seems like the Rose-is-Pink-Diamond theory is kaput with Bismuth refering to her as an ordinary Quartz soldier. Then again, this episode isn't the only one to establish that Rose kept secrets from everyone. Anyone else wondering if being an ordinary Quartz was just what Rose told Bismuth? I don't know how much credence I put into that. I'm just wondering; if Rose wasn't PD, what happened to her? One other thing I thought was odd this week was Amethyst reforming after being poofed by Jasper. She definitely seemed to take a weird shape midway through. At first I thought it was a sign of corruption. Maybe it was just her trying (and failing) to reform as a larger Gem. I like to think that rushing her reformation to get back in the fight is why she's wearing a simple T-shirt instead of something more elaborate.